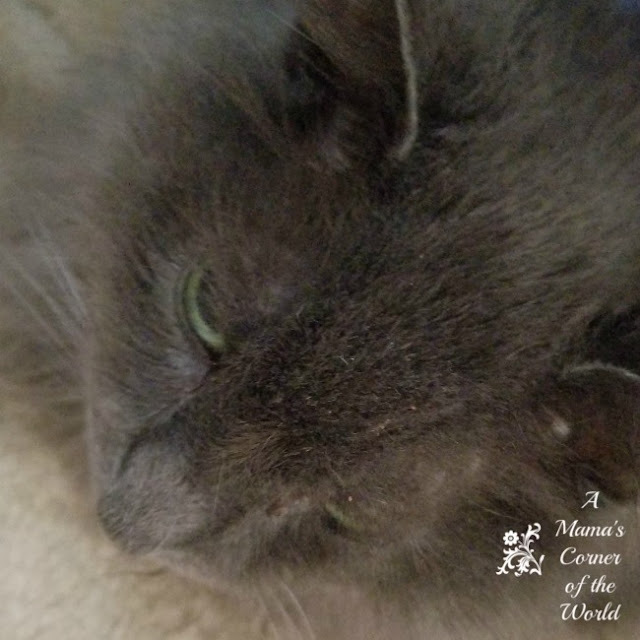 We were missing in action for Wordless Wednesday last week because our resident Mr. Fluffy Tail had a couple of surgical procedures scheduled--and, while the dental work and the lump removal/biopsy were both successful and uneventful; anesthesia proved not to be poor old Mr. Fluff's friend. I lost roughly three days from the world to sleepless nights and "Fluff sitting" as he tried to "come down" from his anesthesia high. 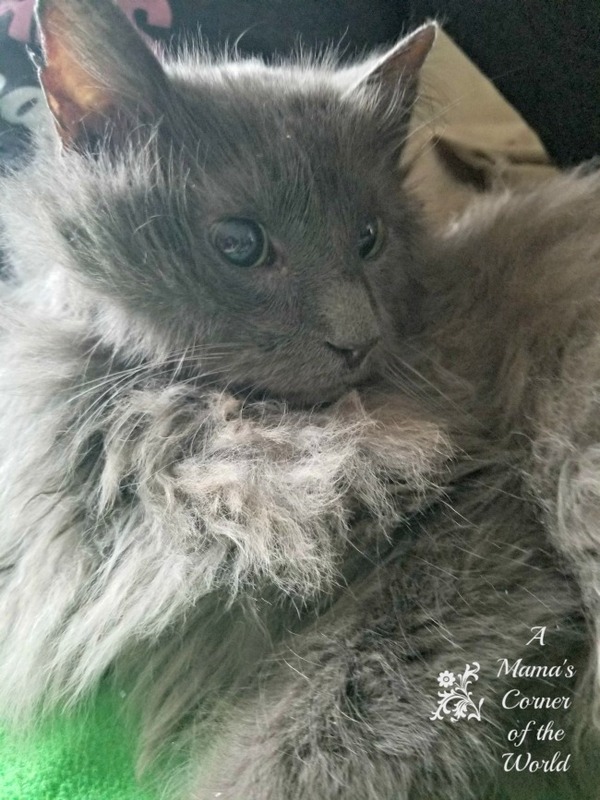 But--we are back this week, Mr. Fluff is finally back to himself--and I wanted to share some photos of my Fluffy man this week as our Wordless Wednesday Link Up! The poor old, senior, guy had this wild look in his eyes for almost a full 48 hours. He is the most laid back cat in the world--100% of the time. The vet technician warned us that he may be a bit "off-balance" or moody when we let him out of his carrier. Fluffy proved to be a "special case". He lost his mind as he "sobered up". He tried to run in circles for the first full day (and night)...yes..for a full 24 hours..after his surgery. Unfortunately, he had zero control over 3 of his 4 legs as he tried to run in circles. We did not have a large crate to enclose him in--and he was slamming his head into the hard, plastic sides of his pet carrier--so we moved as much furniture from the dining room as possible, padded the table legs with pillows, closed the space off and made him a "padded bed" in a corner. Yeah. This was the reality of our "safe padded bed for Mr. Fluff. 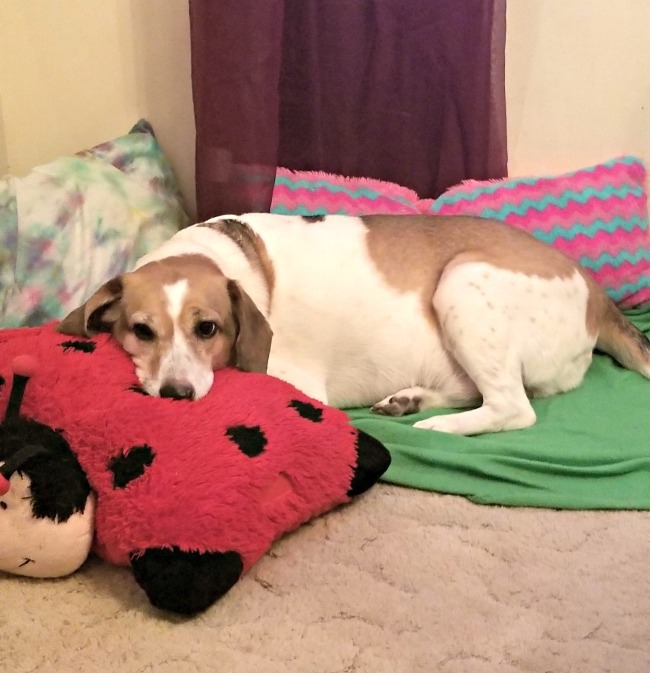 While Mr. Fluffles continued to run in circles and we tried to keep him from running into walls--Mr. Maxi decided that the padded bed was a great addition to the dining room. Unfortunately, Fluff used it for about 20 minutes total during his first 24 hours of mania...Max; however, slept there for about 10 hours. 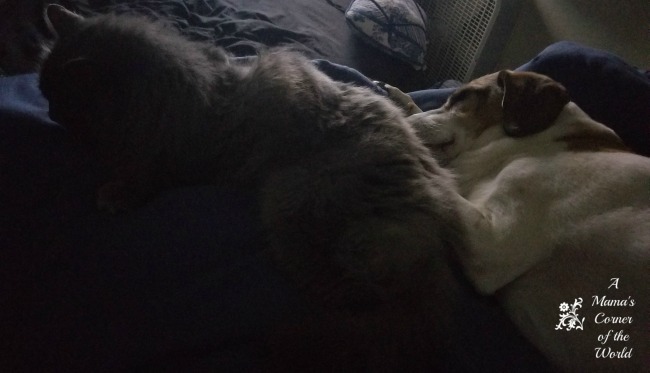 After about 48 hours, Mr. Fluff decided that it was time to snuggle up with his dog. This was my first few hours of sleep. Max was smiling--and he let Fluff settle in to sleep for a few hours before he slipped away and edged off the bed. This was finally the beginning of the Fluffy-anesthetic-wind-down period! On Day 3, Mr. Fluff appeared mostly sane. He was finally drinking and eating on his own--and walking straight which was a BIG plus after the three days we had experienced! Now; however, after a few more days, Mr. Fluff thinks that he is all healed and ready to head outside on one of his usual 30-minute adventures. He is beginning to lose patience with me--but, he has about an inch and a half worth of stitches over his back from his "lump removal"--and I say he is going to remain a full time, house cat until January 29th when those stitches are removed! I think this will likely be Mr. Fluff's last surgery--unless it is absolutely vital. That is why I had them remove his "slow growing/non-issue" lump from his back while he was having his dental abscess cleared out. He is 11 (at least). He adopted us after his elderly owner passed away. He is getting old--and I hope we don't have to put him through another few days like last week again! But--on a positive note--he is eating, his teeth are clean and all of the "problem teeth" have been removed--and the vet doesn't think the lump was anything to worry about. We love Poor Old Mr. Fluff! What photos and experiences are you sharing for this week's Wordless Wednesday Link-Up? Glad Mr. Fluff is okay. He's beautiful! Thank you! He has transformed from a scrappy, outdoor cat to a fairly spoiled indoor cat with limited outdoor adventures. Aww! Good news that he got throught it OK and is now back to normal he looks so cute and looks a bit like a cat I had for 10 years Jaime he was lovely. Thank you--he had us worried for a bit--but, he is back to his usual. We took him in years ago when his elderly caretaker passed away (and the man's kids didn't know he was caring for a cat)...but, we can't remember life before Fluff these days! Glad that Mr.Fluff is feeling better. Thanks for hosting and have a wonderful week. So glad he is doing better now! Have a great week now that things are slowly turning back to normal.